Home › Latest News › LiveWire™ - The future is electric! LiveWire™ - The future is electric! 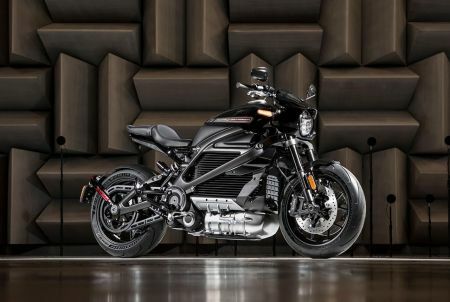 And while some may miss the distinctive sound that has become entwined with Harley-Davidson motorcycles, the LiveWire is designed to produce a tone that increases in pitch and volume with speed –a new sound that represents the smooth, electric power of the machine. LiveWire is powered by a permanent magnet electric motor that produces instant torque and drive, which results in astounding acceleration for a thrilling ride. The motor is located low in the motorcycle to lower the centre of gravity to deliver handling at all speeds and easy control when stopped. The new machine promises performance, control and rider confidence with premium high-performance fully adjustable Showa® suspension, Brembo Monoblock front brake calipers, ABS, traction control and H-D/Michelin Scorcher tyres (180mm rear/120mm front). Plus, the rider can tailor performance via seven selectable riding modes – four of which are set as standard from the factory and a further three modes that can be defined by the user. One of the main questions we’ve been asked is how to charge the LiveWire motorcycle. The bike features a RESS (Rechargeable Energy Storage System, or the main battery) and is also equipped with a small 12-volt lithium-ion battery that powers the lights, controls, horn and instrument display. Charging can be completed using an on-board Level 1 charger that plugs into a standard household outlet with a power cord stored below the motorcycle seat. LiveWire can also be charged with a Level 2 and Level 3, or DC Fast Charge (DCFC), through a CCS2 – IEC type 2 charging connector.